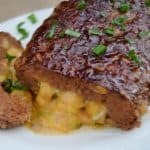 Cheese Stuffed Meatloaf – Easy stuffed Meatloaf with gooey Cheese and a delicious BBQ topping – perfect any day dinner I do not think any cheese lover could say no to this gooey Cheese Stuffed Meatloaf. The Cheese just oozes out with every slice. 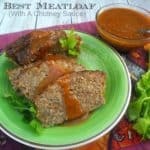 Best Meatloaf with a Chutney Sauce is the best ever Meatloaf baked in a Chutney Sauce and the sauce then served over the meatloaf We do not have meatloaf on a regular basis. However when we do, I always make this recipe for the best Meatloaf with a Chutney Sauce, which is outstanding.